Brighton - the camera on the left, next to a light, is disguised as another light. 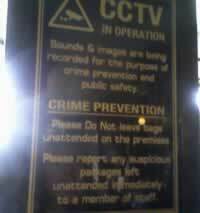 How many people passing by this camera will know that they are under surveillance? Normal street cameras should not bee hidden. 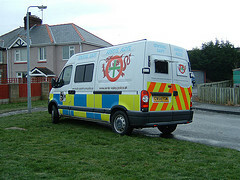 If they are they constitute covert surveiillance and require authorisation under the Regulation of Investigatory Powers Act (RIPA). 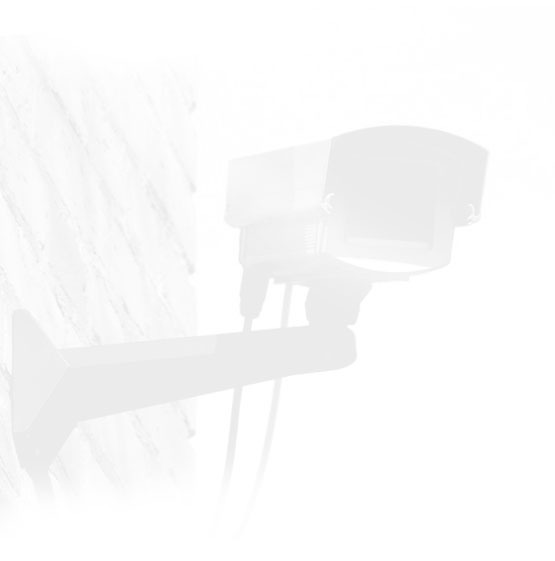 As cameras become smaller and more hidden will notices make it clear where cameras are? 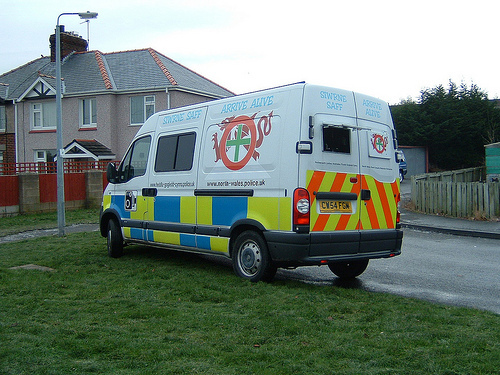 North Wales police 'Arrive Alive' van parked illegaly in Bodelwyddan, North Wales. One would think that taking pictures of speeding motorists from a vehicle parked illegally, and dangerously on a corner, would be illegal in itself. 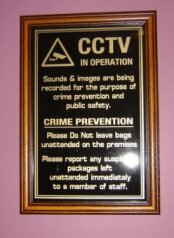 The Hare and Hounds is the latest in an ever growing number of pubs around the UK that is displaying a CCTV sign that tells customers that sound is being recorded. 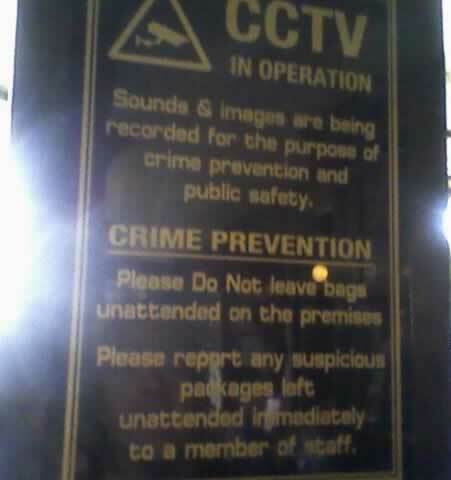 The pub like many others says they are not recording sound - so why do they have a sign that says they do? The local pub used to be somewhere to you get away from the world and enjoy a drink and a chat with your friends. Now it is a place to be ID-ed, monitored, watched and warned! Another pub that says sound is being recorded. The landlord was a very friendly chap who told us that no sound is being recorded and that the sign was supplied by the company that installed the cameras and he hadn't noticed that it was wrong and he said he'd sort it out. Why are these signs being put up in pubs? 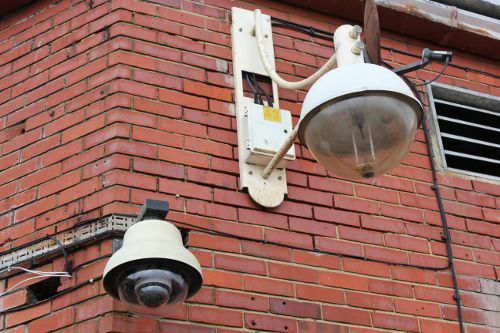 After the Cowley Road Carnival in July, No CCTV supporters visited the Regal only to find that not only had the Regal not changed their CCTV signs, they had actually added several more that also say they are recording sound as well as images. The Oxford Times reports that the Regal has "47 security cameras inside and out"! The club has been praised fot its tough anti-drugs stance by papers in the Newsquest group. The reactionary press seem to think that searching EVERYONE before they enter the club and subjecting them to extreme levels of surveillance is a good thing. Seems to us like guilty until proven innocent. The management of the Regal in Oxford have assured us that their cctv system does not and never has recorded sound. Apparently the notices they purchased were the wrong ones. We understand that the signs in the venue have now been changed to reflect the system they actually have which they assure us is in line with the Information Commissioners Office's recently released CCTV code of practice. 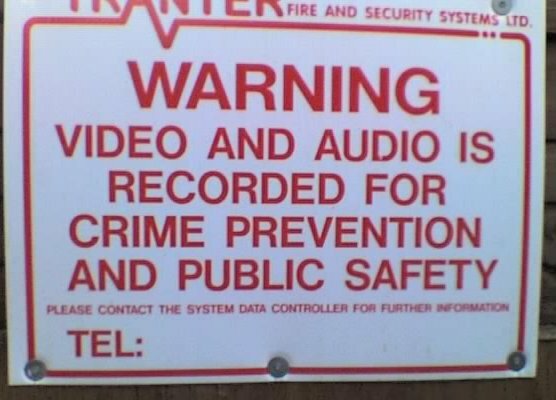 The code states: "CCTV must not be used to record conversations between members of the public as this is highly intrusive and unlikely to be justified. You should choose a system without this facility if possible. If your system comes equipped with a sound recording facility then you should turn this off or disable it in some other way." 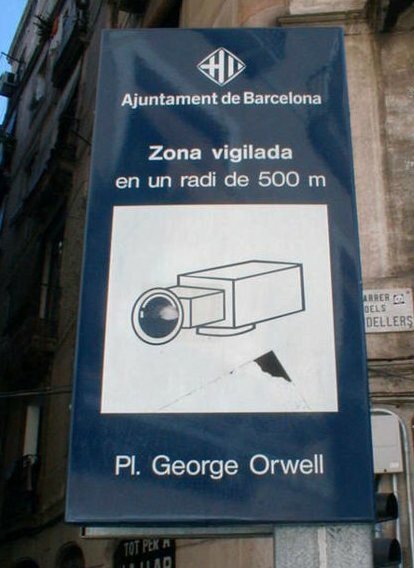 The Catalonian authorities clearly haven't read 1984. Or have they? For further discussion see our Spring 2008 newsletter in the newsletters section.